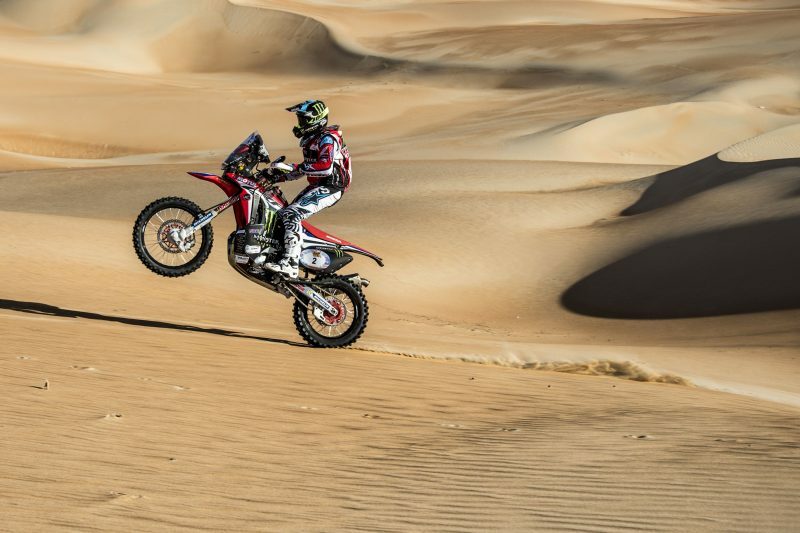 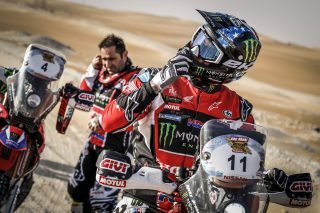 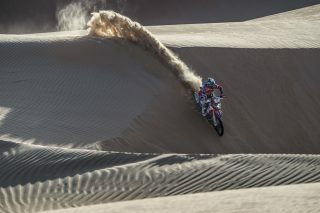 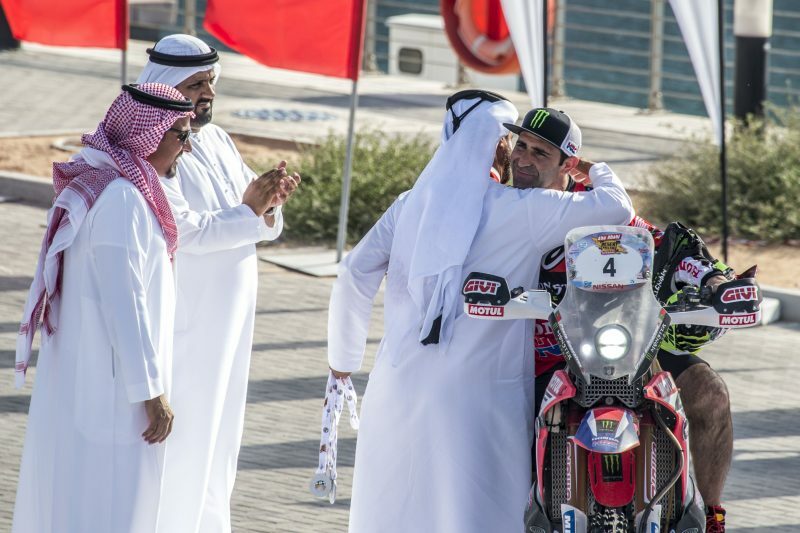 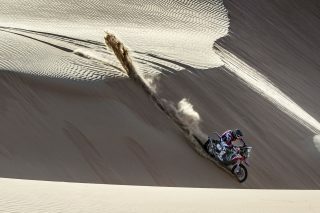 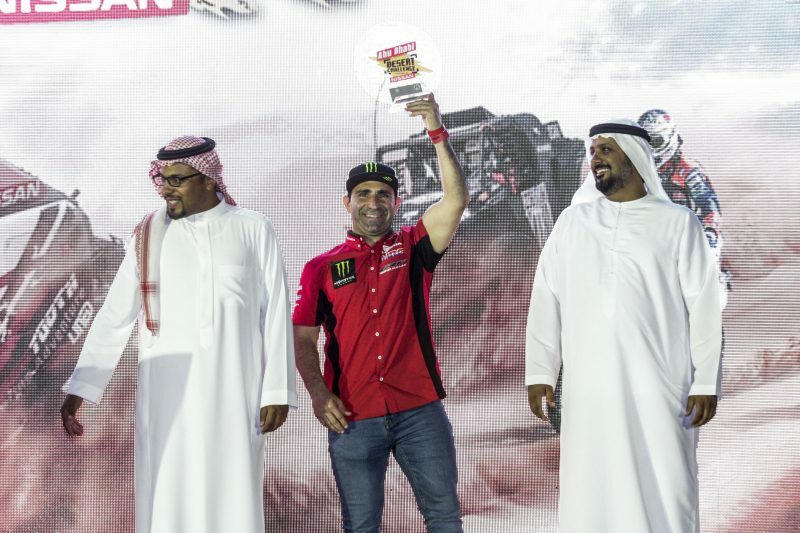 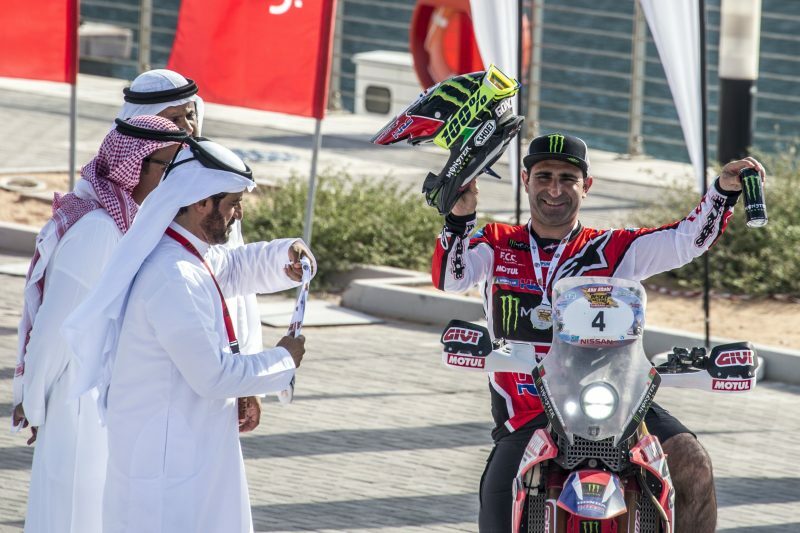 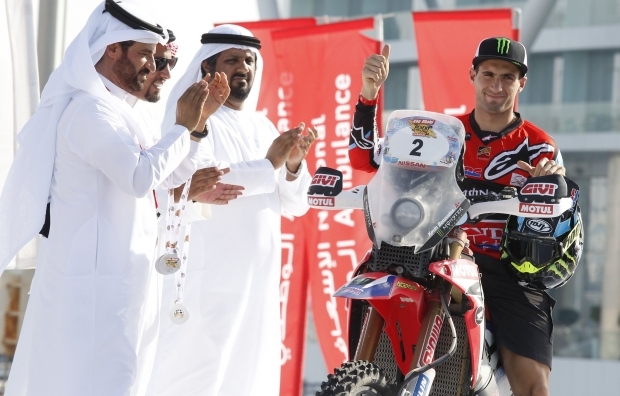 Monster Energy Honda Team got the rally season underway with the Abu Dhabi Desert Challenge. 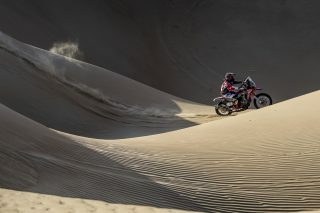 The first round of the FIM Cross-Country Rallies World Championship saw, for the first time, the participation of all five team riders getting their first post-Dakar taste of desert racing. 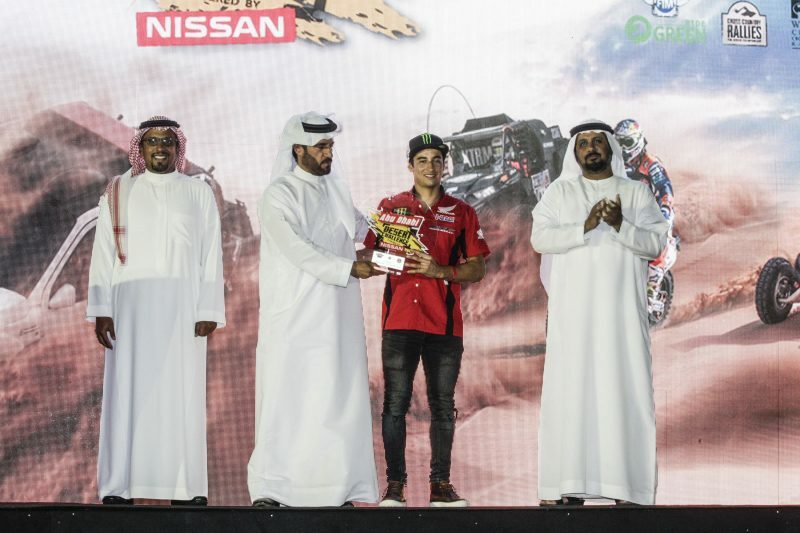 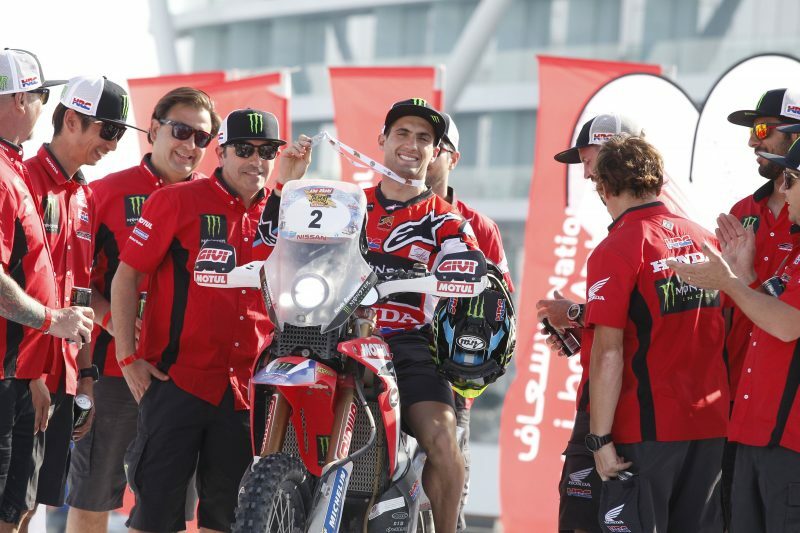 Kevin Benavides’ third place overall and the victory in the Junior category of José Ignacio Cornejo can be considered a fair overall outcome for Monster Energy Honda Team. The squad, back in action for the first time since the Dakar, progressively eased their way into the race. 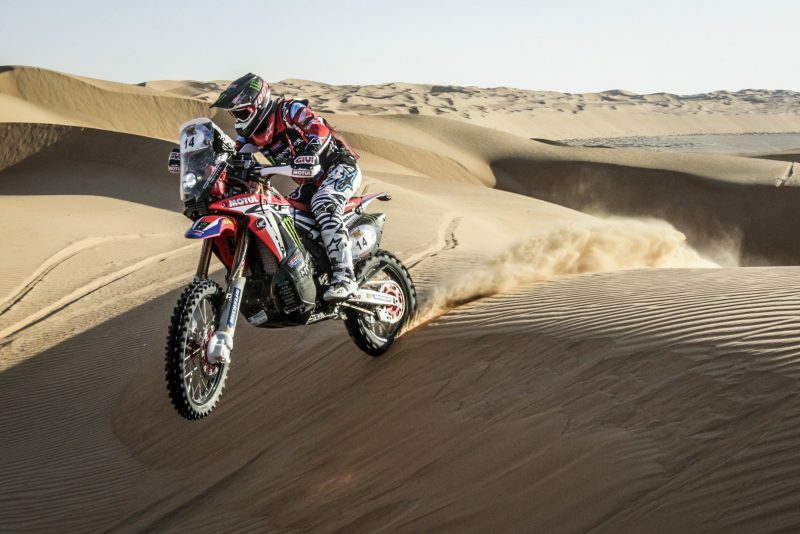 The hazardous characteristics of the first round of the world championship meant that no precaution was too much. 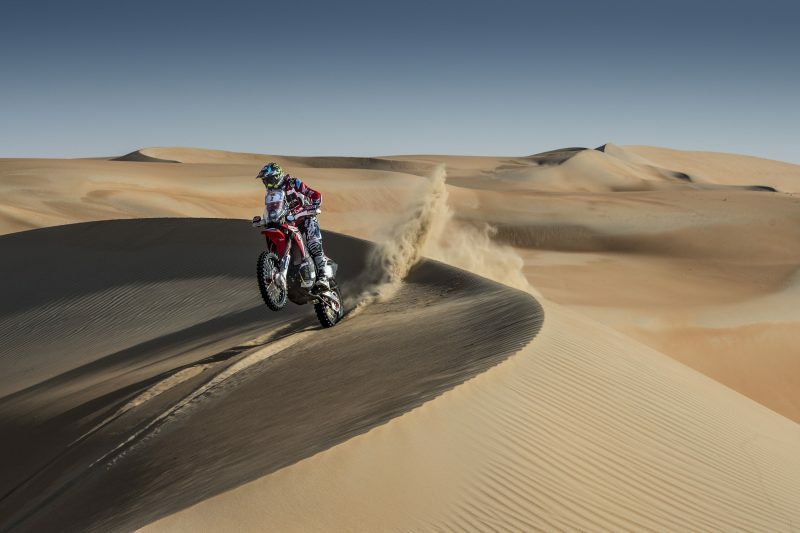 The high speed open desert course, full of barely visible dunes and cut dunes made for a highly treacherous and complicated ride. Another point on the positive side of the balance sheet was that none of the five Honda CRF450 RALLYs produced even the slightest setback despite the demanding conditions. 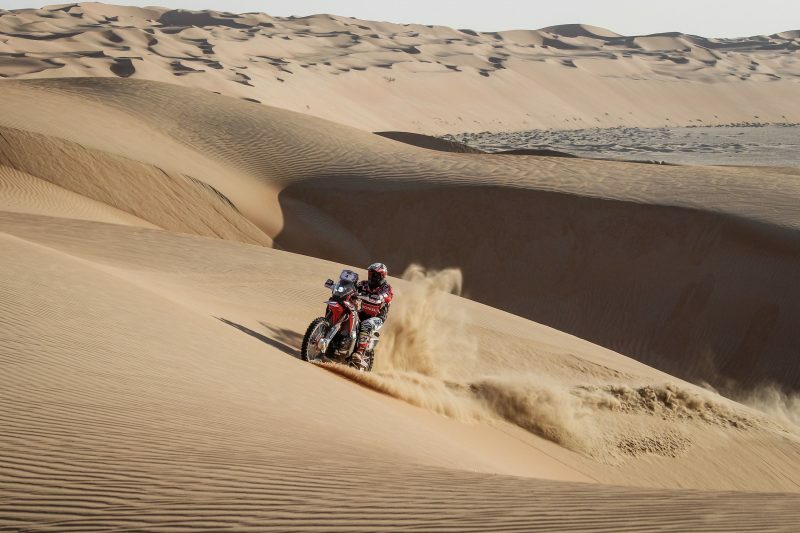 There was no shortage of extreme temperatures hovering around 48 degrees, plus huge amounts of sand and dust-filled tracks to deal with. 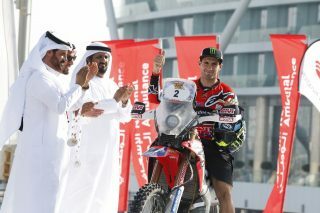 Argentine rider Kevin Benavides set a swift pace throughout the week and was rewarded with a podium place. Portuguese rider Paulo Gonçalves returned to competition after the injuries that ruled him out of the most recent Dakar 2018, just days before it was due to start. 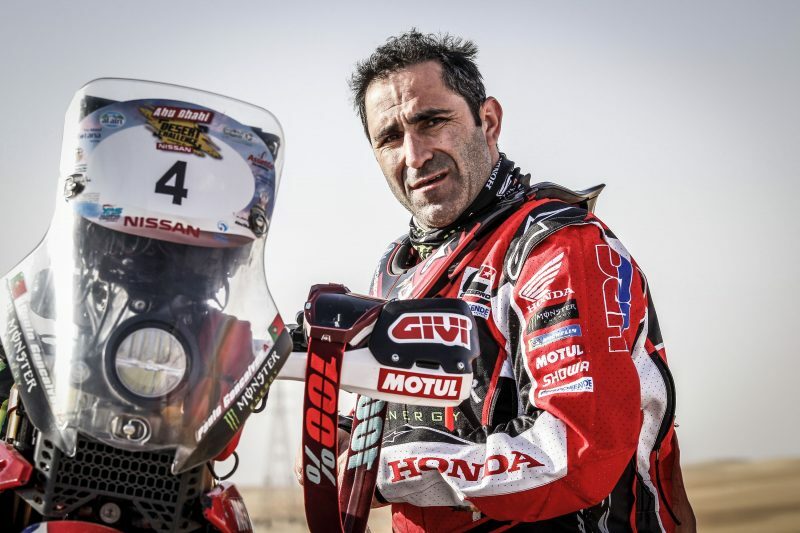 Paulo grew in strength by the day and, despite a fall, managed to post a respectable fifth place overall. 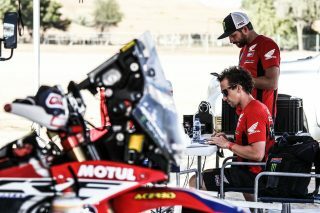 Also getting back into racing after the two-month hiatus were American Ricky Brabec, sixth overall, and the team’s latest signing Chilean José Ignacio Cornejo, who in addition to finishing eighth, managed to clinch the Junior title. 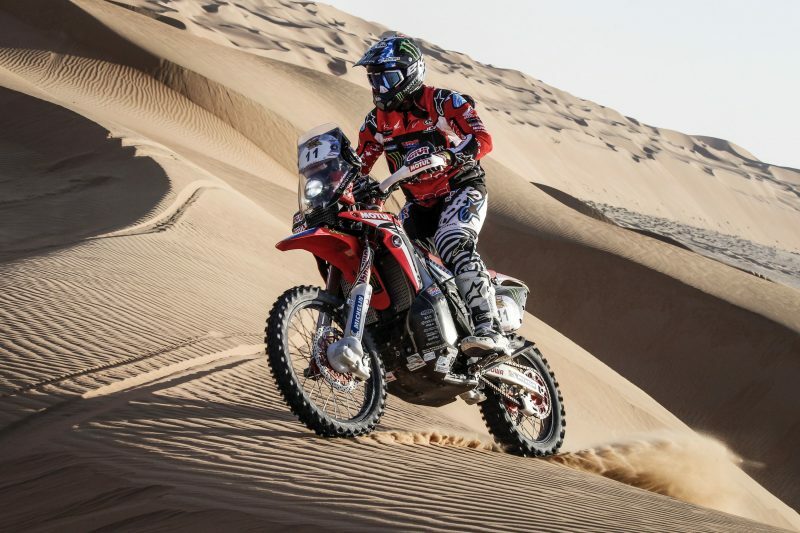 Michael Metge, unable to find the correct suspension settings early on in the rally, had to eventually settle for ninth. 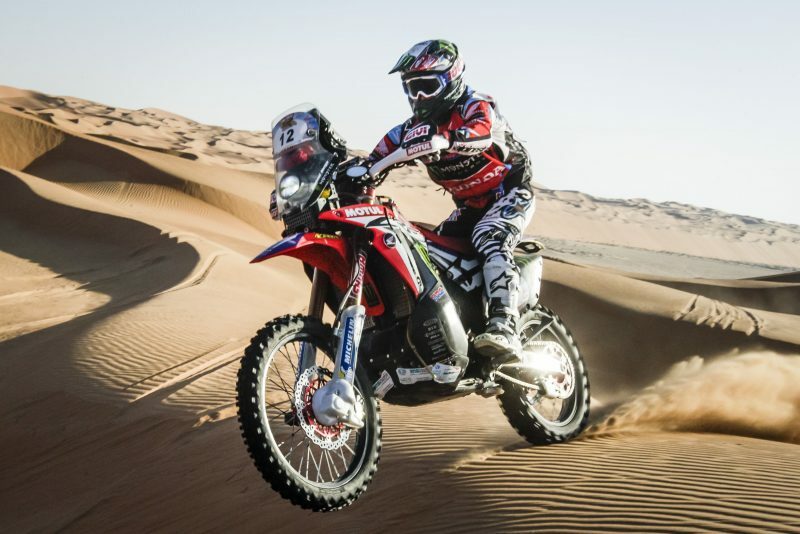 The team is not scheduled to take part in the Qatar Rally, the next round of the World Rally Championship, but will be back to race the Merzouga Rally, in Morocco, from April 16 – 20. 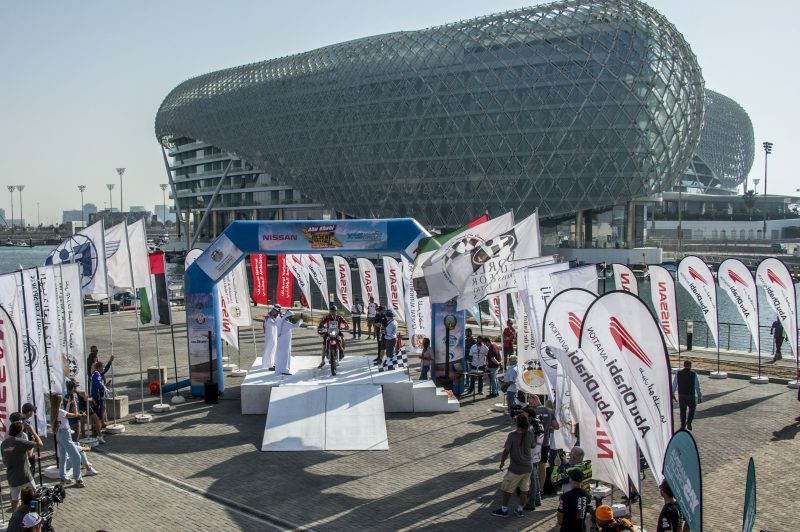 The technical scrutineering will take place on the 15th. Joan Barreda is expected to rejoin the team after recovering from the wrist operation that he underwent in February. 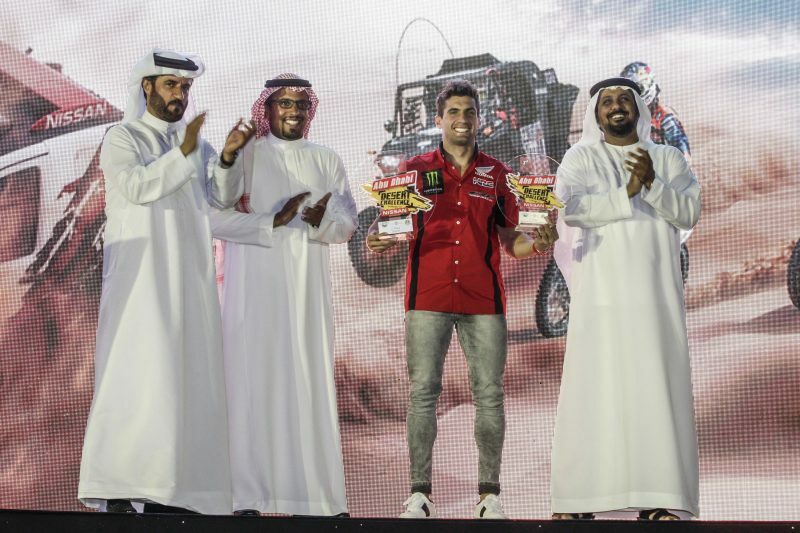 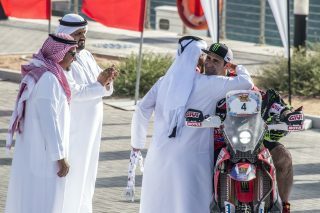 The Abu Dhabi Desert Challenge was the first race of the season of the Monster Energy Honda Team, where all the five riders participated, in which we aimed for higher brand and team visibility, while hoping to maximize our efforts in the world championship as much as possible. 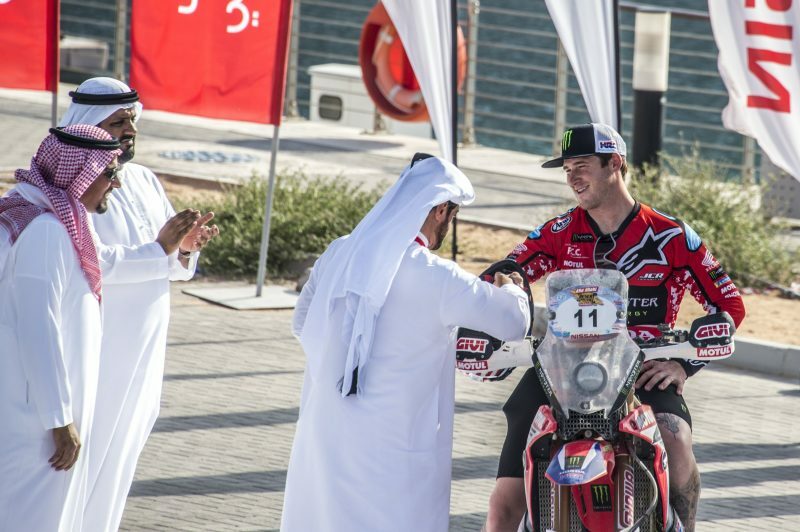 The Abu Dhabi meeting is always complicated by the intrinsic characteristics of the race itself: the waypoints are on an open arrow, so there is not much navigation. 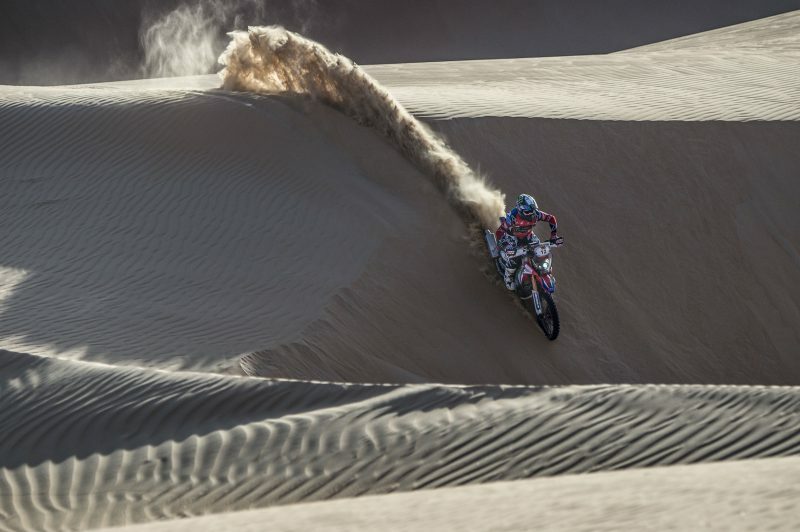 This means that every time it goes very fast practically in a straight line, without looking at the navigation display so much, which implies a greater degree of difficulty to in high-speed areas with very dangerous cut dunes. 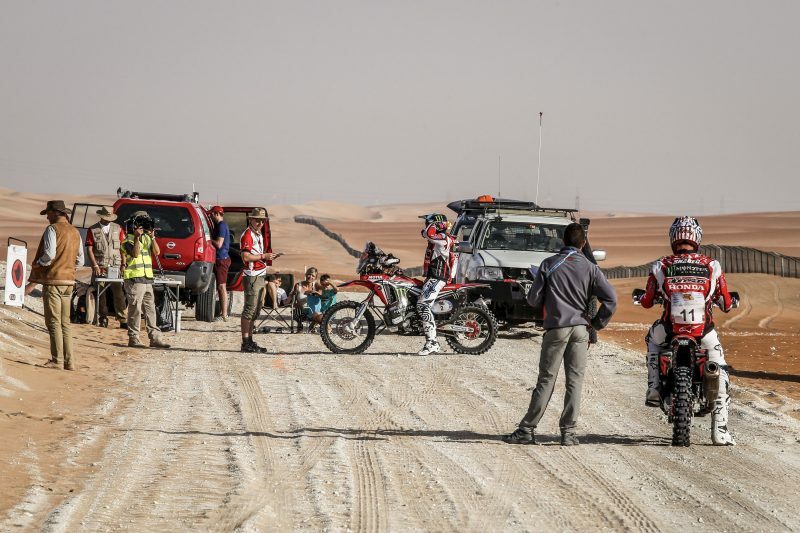 The riders took many precautions until they finished "reading" the terrain. It was a bit difficult for the riders to adapt at first. 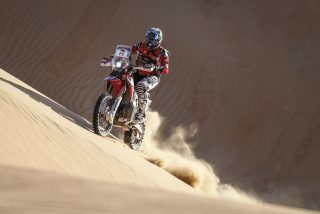 They went cautiously over the first two stages, increasing their speed as they adapted to the environment. The Honda CRF450 RALLY have worked very well in this demanding desert, with temperatures above 48 degrees. Kevin Benavides had a good race and his third podium is one we are satisfied with. 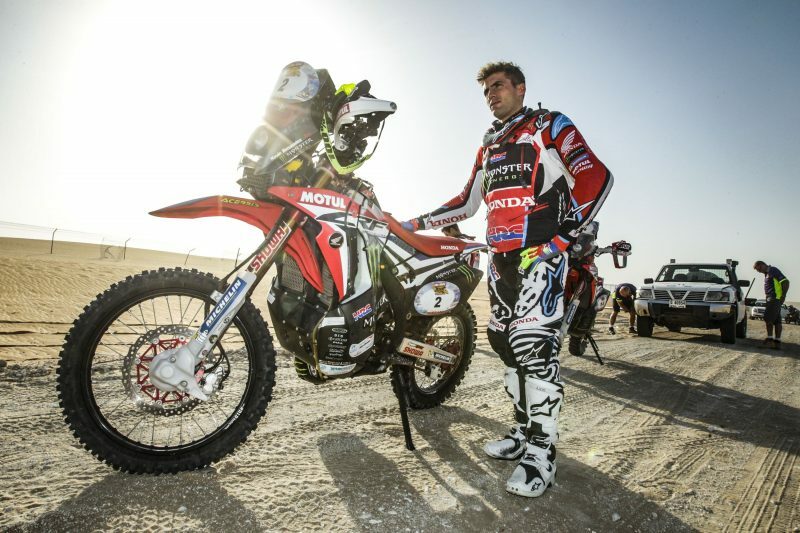 It was the first time that Paulo had got on the bike after his injury and everything was a big unknown. 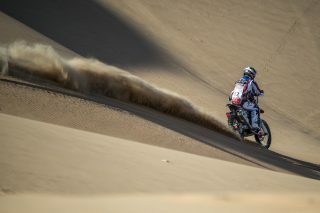 He rode better by the day, picking up the pace as he went to finish the final days amongst the front runners. We expect that he’ll be back in the leading group by the next race. 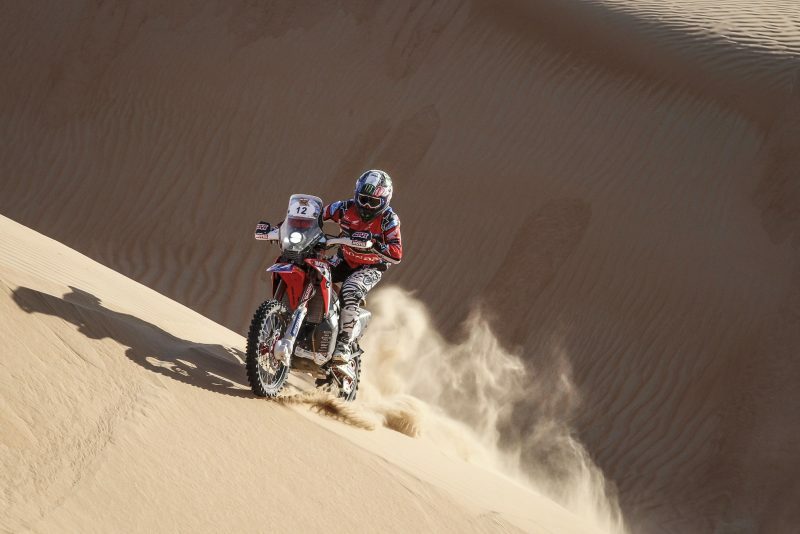 Ricky Brabec was somewhat hampered by the high speeds of the first few days and he found it hard to adapt to the demanding environment. His result is good when you consider that he finished without any issues and without taking risks. 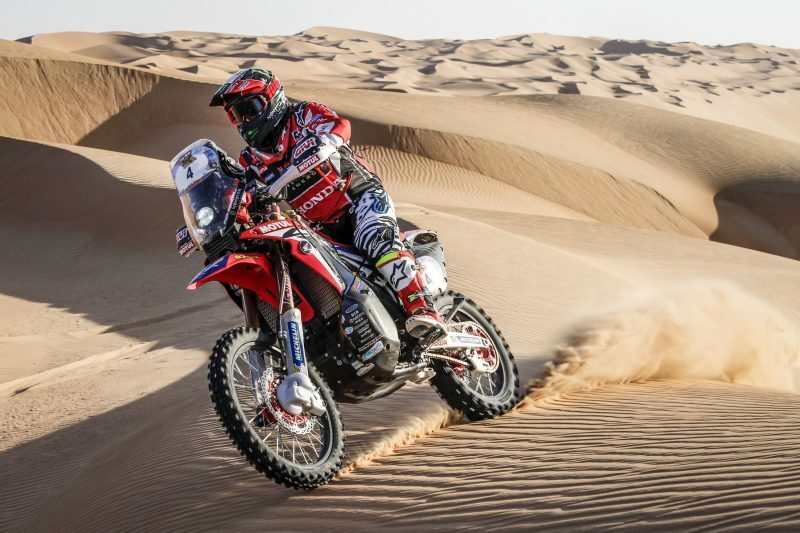 Michael Metge couldn’t find the right suspension settings for the bike to attack this type of terrain and so he suffered a bit over the first two days. 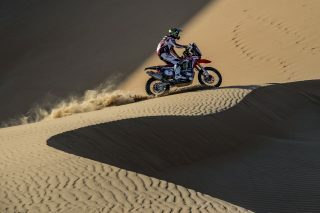 That made it more complicated to try and pull back, so he concentrated on navigation and developing his skill than merely looking for a result. Finally, Nacho Cornejo, who was back aboard the Honda CRF450 RALLY after the Dakar, had a good race and improved over the course of the rally. 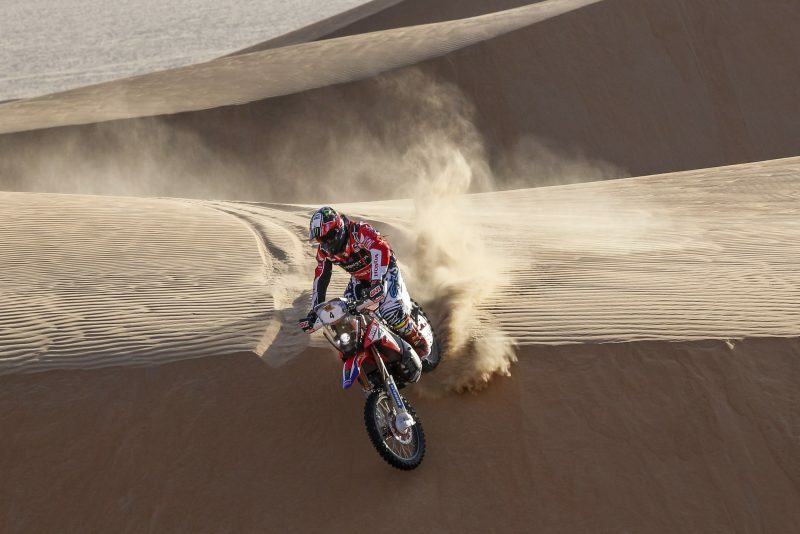 He’s really beginning to find the pace of the frontrunners which is very satisfying. On this occasion, as I said, the team has brought five riders unlike other editions, where we participated with two or three pilots. 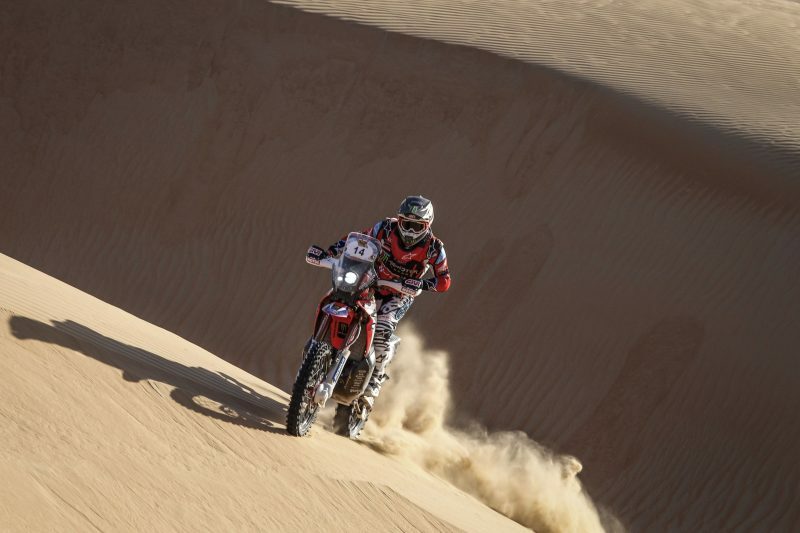 The result has been positive for the acclimatization of the team and the pilots. 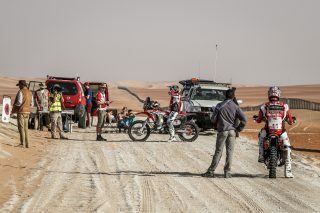 The team has worked hard and the mechanics have done a great job during these days in which we have also been able to enjoy the immensity of this desert, beautiful but at the same time dangerous. 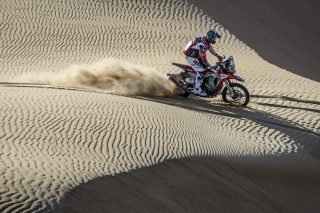 The next appointment with the World Championship will be at the Atacama Rally, in August, although before we will be in Morocco where the Monster Energy Honda Team will be with all its riders. It will be an interesting race to which we will try to get the most out of it. 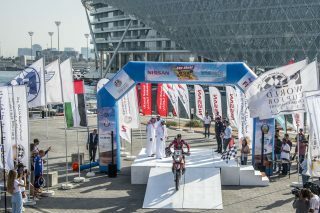 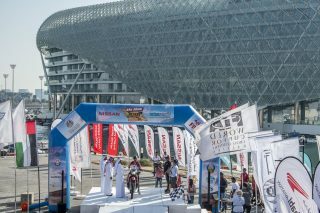 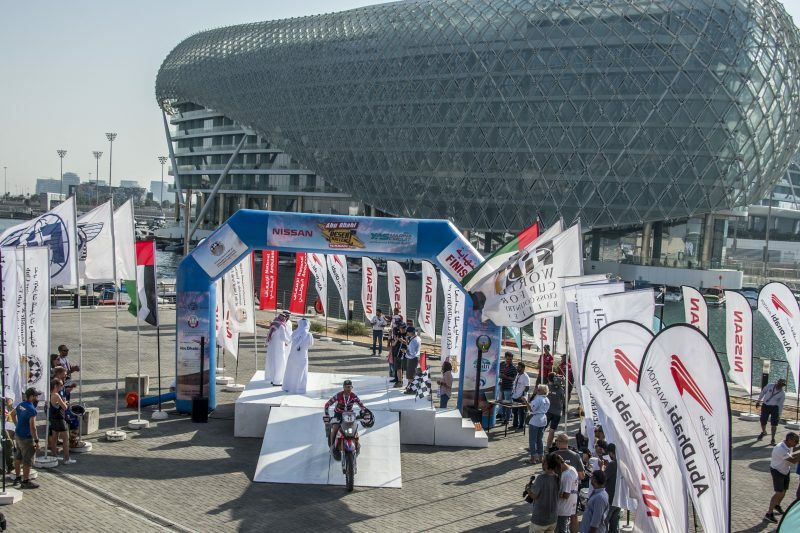 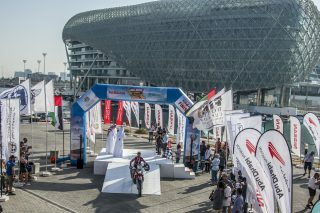 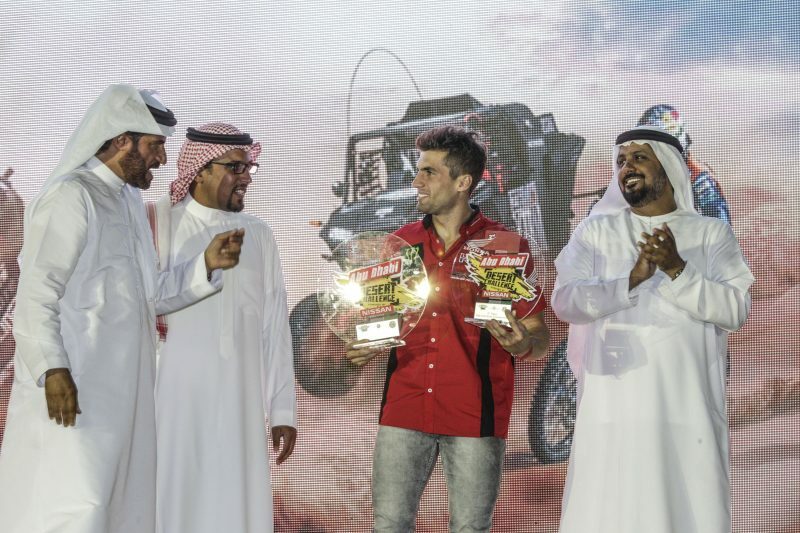 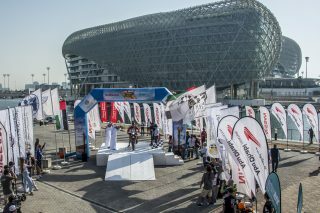 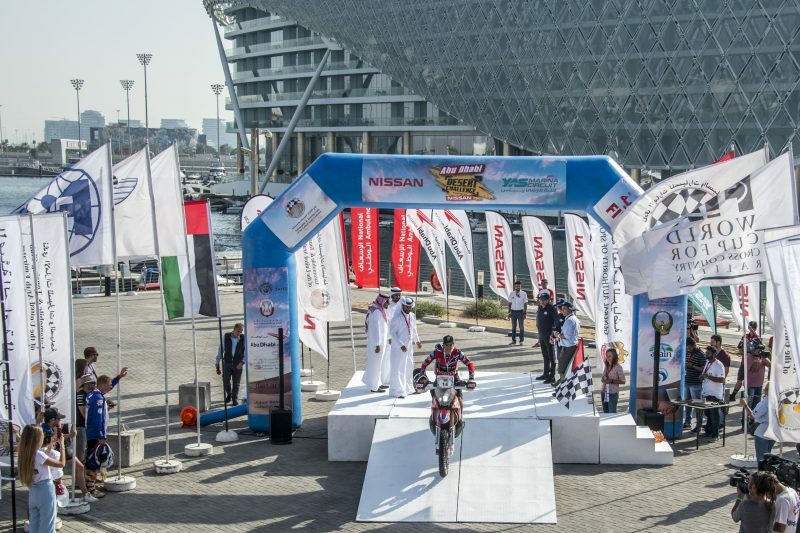 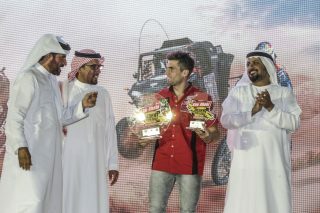 The erstwhile UAE Desert Challenge, one of the world’s most prestigious international cross country rallies, entered a new era in March 2009 when it was renamed the Abu Dhabi Desert Challenge with the five-day motor sport spectacular being staged in its entirety across Abu Dhabi emirate under the auspices of the Abu… read more.